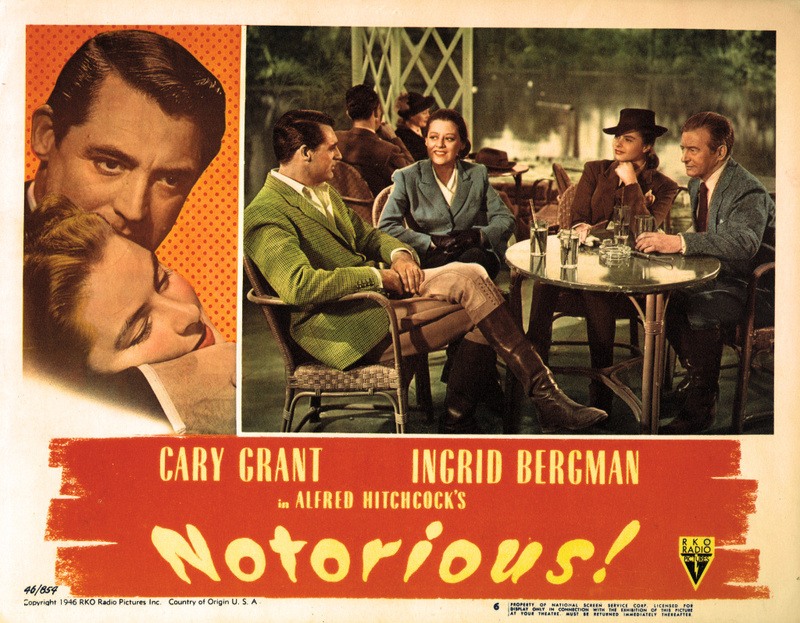 Released across the country 72 years ago last week, Notorious includes the director’s traditional elements of suspense, romance, and comedy in a contemporary espionage tale of a Nazi spy’s daughter (Bergman) recruited by a dashing agent (Grant) to infiltrate her father’s organization by seducing the urbane Alexander Sebastian (Rains). Hitchcock’s research for the film’s MacGuffin of uranium had him placed on an FBI watch list for a time, but it was a kiss rather than radioactive materials that brought Hitch closer to actual trouble with the U.S. government. Cary Grant and Ingrid Bergman share a code-defying three-minute kiss in Alfred Hitchcock’s Notorious (1946). “Excessive or lustful kissing” was one of many items prohibited by the Hays Code, preventing even the most passionate of on-screen couples from locking lips for more than three seconds. 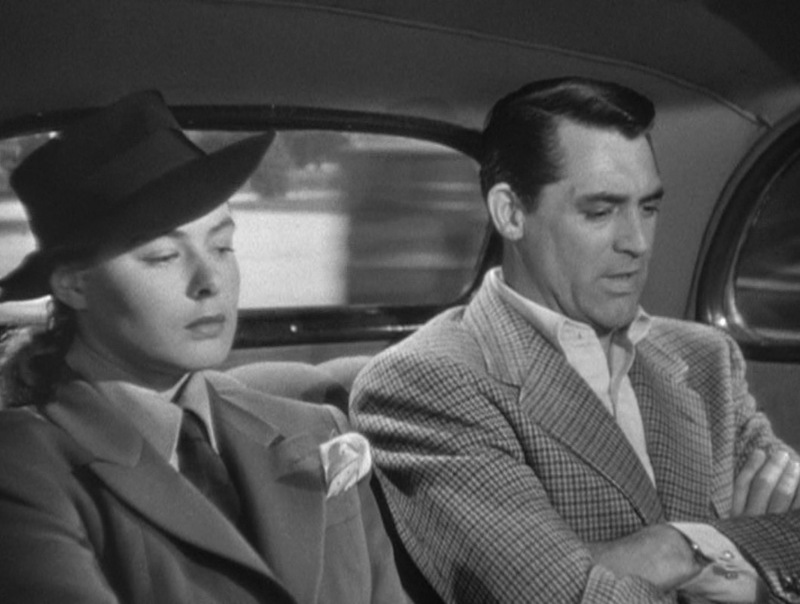 Aware of this restriction and more than willing to circumvent it, Hitchcock designed a sequence that would have Cary Grant and Ingrid Bergman kissing for a full two-and-a-half minutes, though the two would break apart every three seconds as they walked and nuzzled together through the scene. 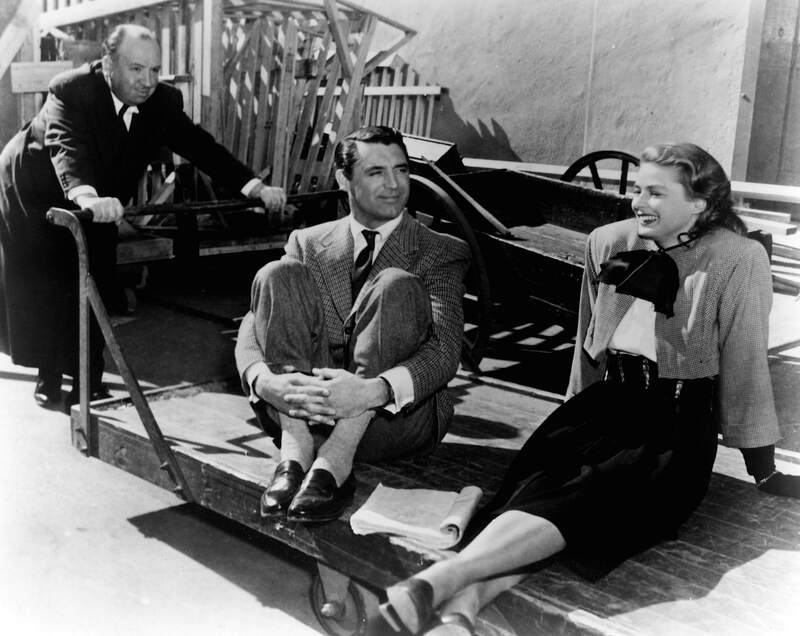 Grant and Bergman, who began a lifelong friendship while filming Notorious, displayed enough chemistry on-screen to conceal the awkwardness they felt while filming the scene. “Don’t worry, it’ll look right on the screen,” he told the actress. And how right he was. Along with this film’s impressive tracking shot that begins on a second floor balcony and ends with a key clasped in Bergman’s hand, the two-and-a-half minute kissing scene is regarded as one of Hitchcock’s superlative sequences from his career. Thank you to BAMF Style reader R.M. for calling my attention to this photo. Do we know anything more about this photographer? 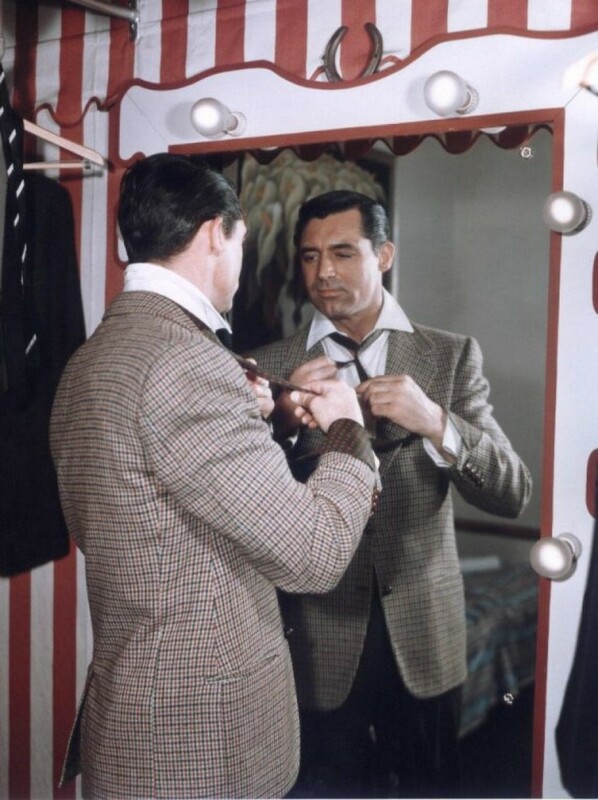 When not in his sharply tailored suits or evening wear, Cary Grant’s T.R. Devlin dresses down for an afternoon in Rio with a single-breasted sport jacket in classic gun club check. This criss-crossing four-color pattern was adapted by the American Gun Club in 1874 from the original Scottish “Coigach” estate check. Update! A comment from BAMF Style reader R.M. brought my attention to this marvelous color photo from early 1946 that appears to show Grant getting dressed for the role of T.R. Devlin. If the colors in this photo are indeed original, then Grant’s jacket appeared to be checked in navy and brick red on a beige ground, differing from the contemporary lobby cards and promotional art that colored it closer to olive green. The trousers appear to be dark brown, and the tie follows the same earthy color scheme, in an olive shade of brown with a red-bordered tan foulard pattern. The notch lapels of the jacket roll to the top of three woven leather shank buttons, and Grant typically wears the top two fastened. There are also four smaller woven leather buttons on the end of each sleeve. The jacket cut is contemporary to the mid-1940s with a fashionably full cut, wide shoulders, and draped chest. There is a single back vent. The hip pockets are jetted but the set-in flapped pocket on the left breast adds a sporty detail that slightly dresses down the jacket while adding a unique identifying element. A well-tailored sport jacket nicely bridges the gap between relaxed formality and buttoned-up business as needed. By his mid-40s, Cary Grant was already enough of a confident style authority to know what he found to be both comfortable and flattering, a must-have combination for a man who spends many hours in front of the camera. His style experimentations resulted in the establishment of an otherwise uncommon fusion of an Ivy League-style button-down collar shirt with double (French) cuffs. These are almost impossible to find off-the-rack, though Brooks Brothers does offer a limited number of shirts – like this one – available in this combination. Grant’s GQ advice doesn’t mention his preference for the soft button-down collar, but those who have tracked his style through his career notice its frequent presence in his films. 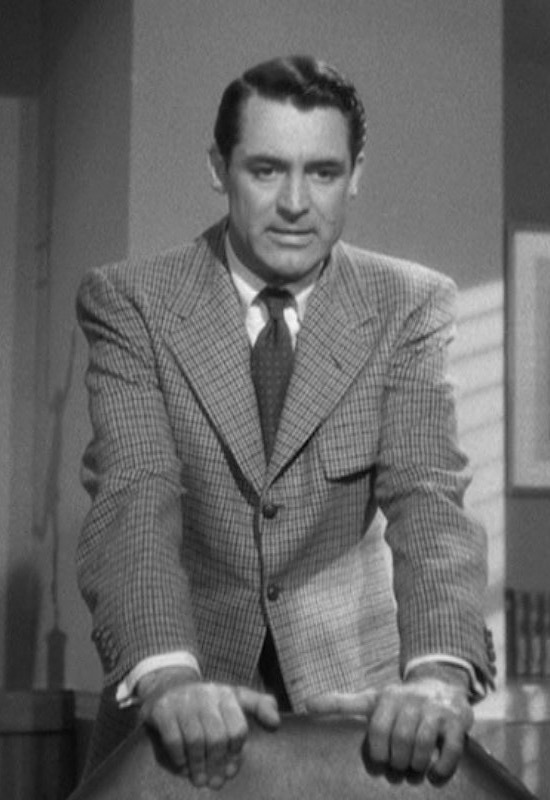 With his suits and this sport jacket in Notorious, Grant wears a white cotton shirt with a luxuriously rolled button-down collar and double cuffs fastened with a set of engraved round links. T.R. Devlin tops off a round of highballs during his afternoon date with Alicia Huberman. With such a noticeable pattern, Grant wisely keeps his shirt and tie subdued. His dark tie has a mid-colored foulard pattern and is tied in a neat four-in-hand knot with a dimple. Exactly a decade before Notorious was produced and released, G.H. Bass of Wilton, Maine, introduced the “Weejun” to the world. This slip-on shoe soon gained its “penny loafer” moniker for the prep school habit of slipping pennies in the diamond-shaped slot across the shoe’s top strap. At the time of its 1936 introduction, this shoe was mostly worn in extremely casual situations or at home, but it grew to more formal acceptance with sport jackets and blazers within the following decade. 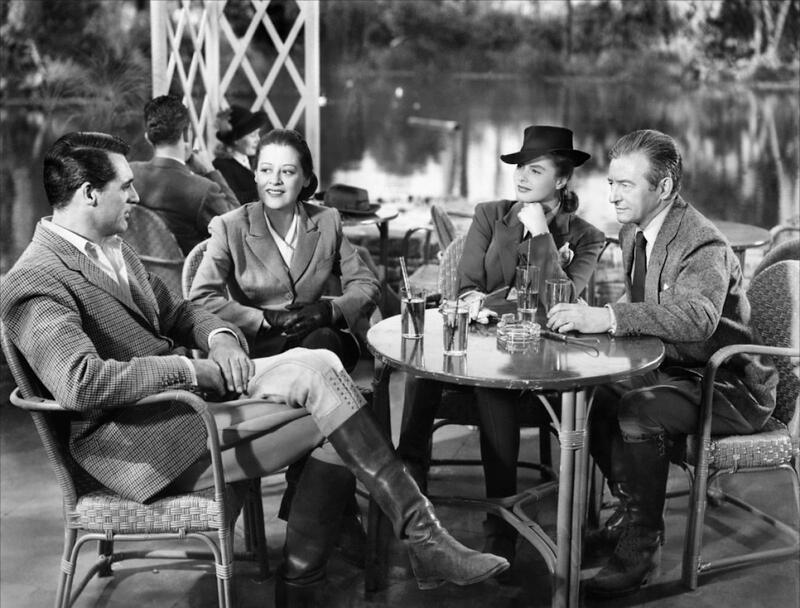 By the time Notorious was produced in 1946, the penny loafer was perfectly acceptable footwear for an American gent to wear with a casual sport jacket and tie as T.R. Devlin does in Rio. Based on the shade of the leather seen on screen and Grant’s frequent on- and off-screen practice of wearing brown loafers with gray hosiery, we can assume that T.R. Devlin’s shoes in Notorious are brown leather Weejuns with light gray socks. Behind-the-scenes photo of Hitchcock on set with co-stars Grant and Bergman. When in the city, Devlin balances the patterned jacket with a pair of solid trousers in a mid-colored flannel. These pleated trousers have side-pockets and are finished on the bottoms with turn-ups (cuffs). However, a day on horseback calls for attire better suited for the activity. Devlin’s sporty gun club check jacket is appropriate for a ride in the country, and his favored button-down style keeps his shirt collar from flapping up into his face during the constant equestrian movement, even with the top two buttons undone in the absence of neckwear. Devlin’s equestrian gear includes tall brown leather boots that rise to just below his knee. His light gabardine riding breeches have seven lace eyelets visible down from the knee area to just above where the trouser legs tuck into the boots. Making connections after post-ride libations. 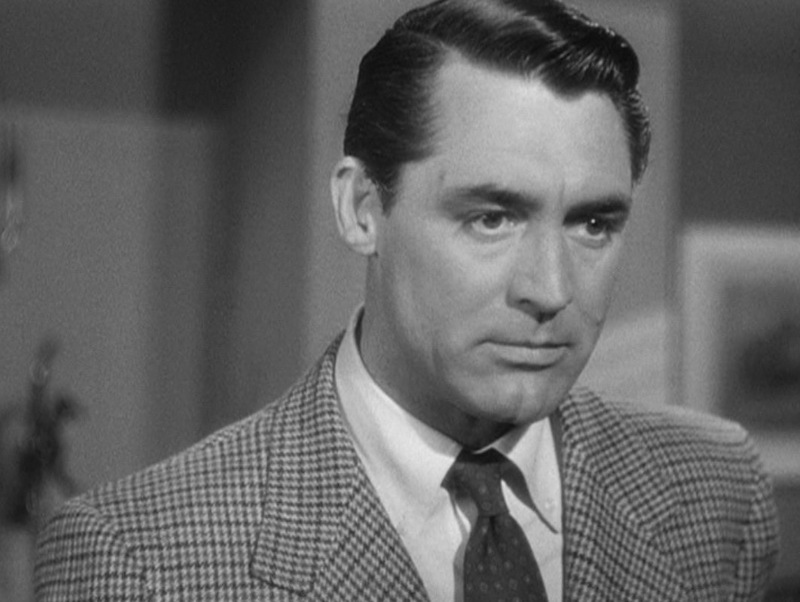 Only a glimpse of Devlin’s wristwatch is available under his shirt cuffs, but he most likely wears the same Cartier Tank on a dark leather strap that Cary Grant wore in real life. For a day of equestrian pursuits, Devlin ditches his tie and swaps out his disc-shaped cuff links for a set of pearl semi-sphere links. 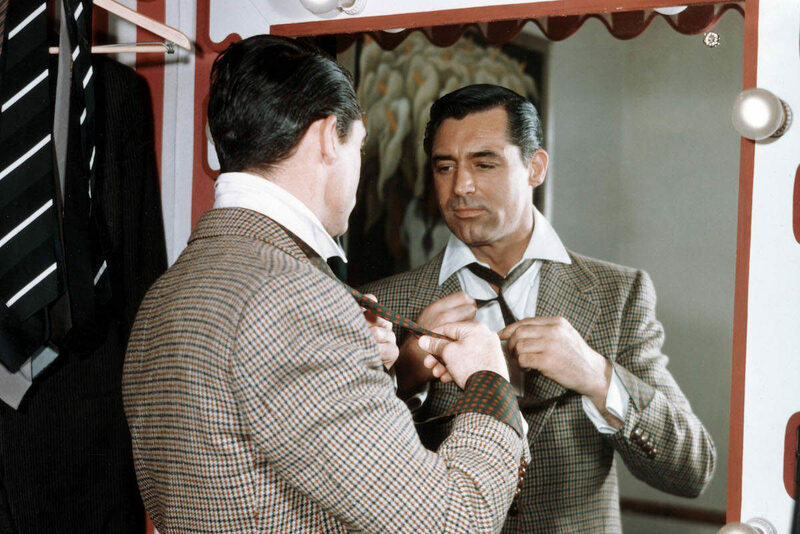 Cary Grant often brought his own tasteful tailoring to his roles, and T.R. Devlin in Notorious is no exception. Devlin adds sophistication to a sporty dressed-down outfit with a uniquely detailed jacket, a button-down shirt worn with cuff links and a tie, and slip-on penny loafers. 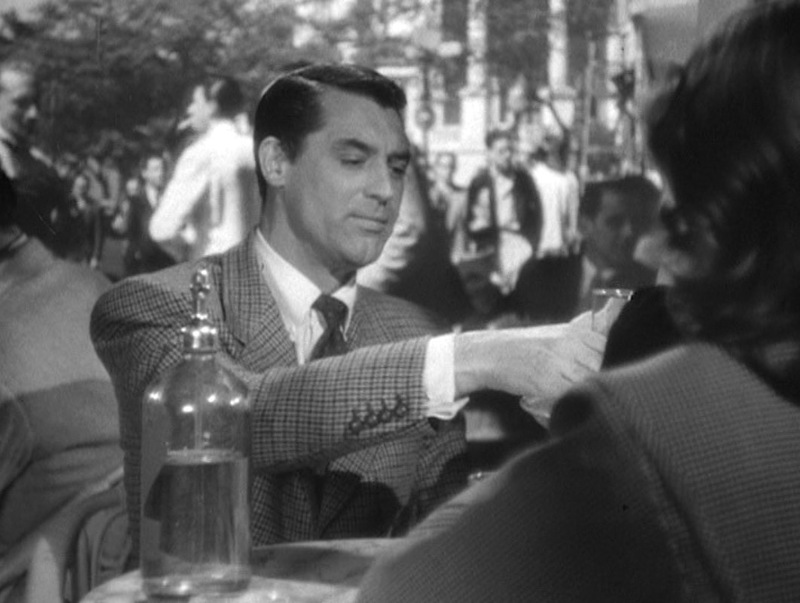 I watched “Notorious” for the first time a few weeks ago – a fabulous film for the acting skills and chemistry of the stars, and the suspense. Thanks for the article reminding me of some of the elements I so much enjoyed. Thank you for posting this! One of my favorite films. Grant’s shoes might be cordovan, as were his cap toed oxfords in North By Northwest. Paul Frederick Menswear used to offer a Button down collared shirt with French Cuffs, but I think its only available as a custom order now. Once again, Grant offers a perfect paradigm of how to dress in an elegantly casual way that looks great in a number of social situations. Nice casual jacket. 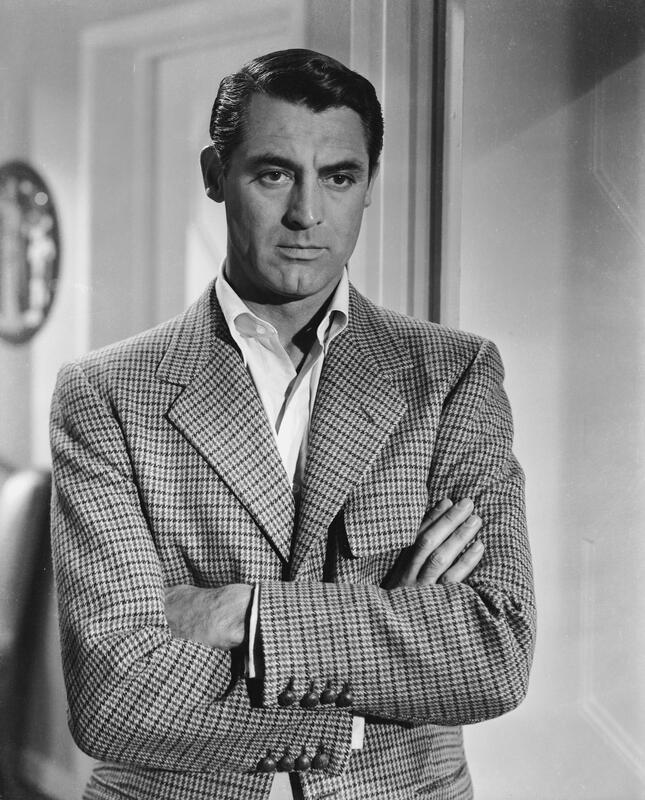 And Cary Grant looks good in pretty much anything. Yes, I think it must be! Great find! What all do you know about this photo? 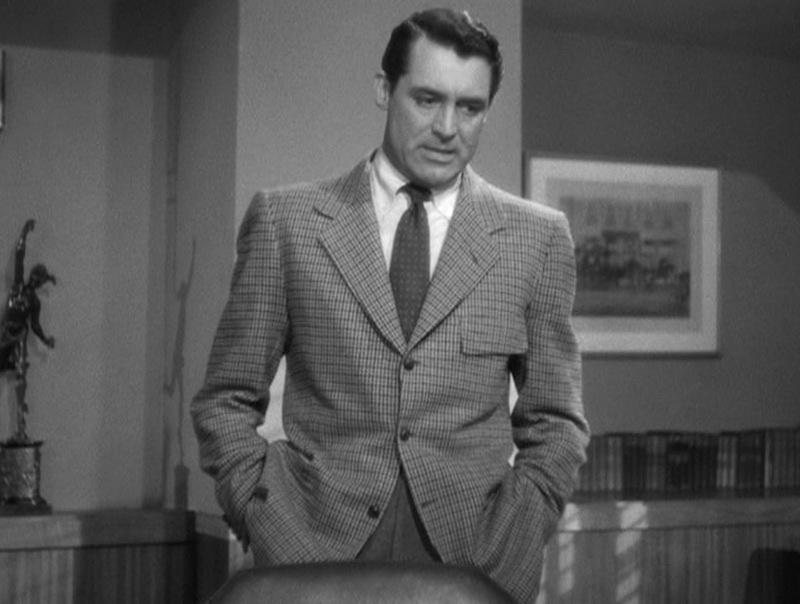 Zilch, do you think it’s been colourised or are these the actual colours of Cary’s jacket and tie? Shirt doesn’t appear to be the offbeat button down. Looking at the picture again, could that be the repp tie and pinstripe suit on the left?